Space X is ready to launch another cargo mission to the International Space Station on Wednesday. 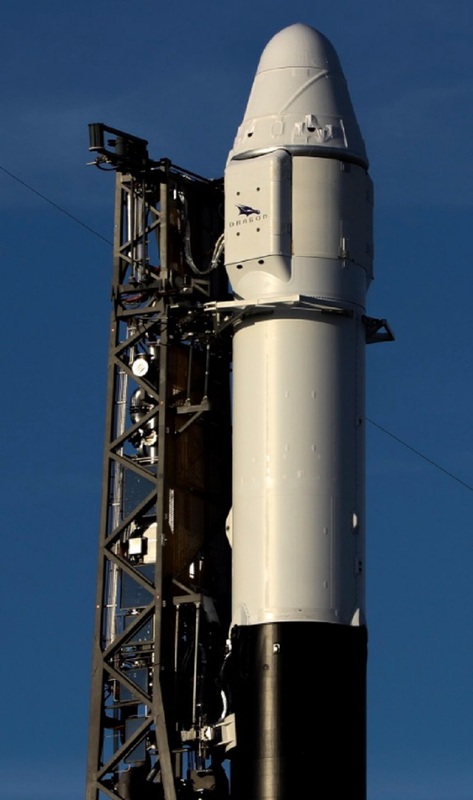 A Falcon 9 rocket will be launching a Dragon capsule from Cape Canaveral Air Force Base in Florida. This will be the Dragon’s second supply mission to the orbiting lab, with its first back in early 2017. The launch window is set to open at 12:16 PM CST on Wednesday, and the forecast is at a 90% chance for a go. You can watch the launch live here. 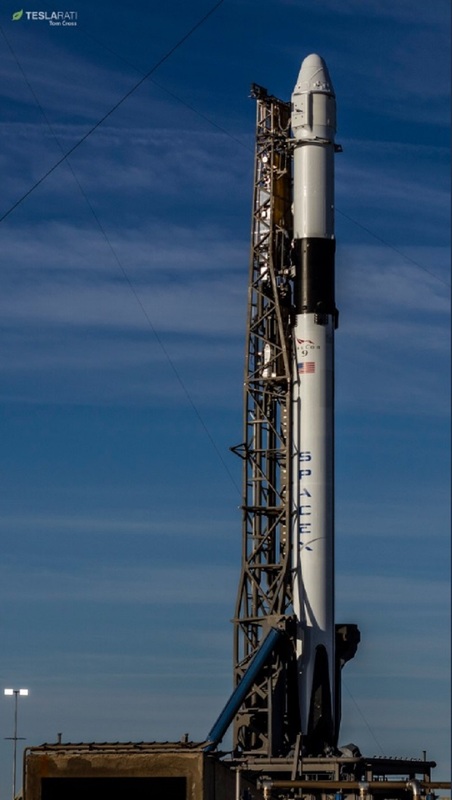 Image: CRS_16 ready for the December 5, 2018 launch from Cape Canaveral Air Force Station in Florida. The Dragon capsule will be delivering more than 5,600 lbs. of food, supplies, and scientific experiments to the crewmembers on the ISS – making it SpaceX’s 16th cargo mission under their contract with NASA. This launch was actually supposed to take off yesterday, but was delayed a day because the mouse food accompanying a rodent experiment was found to be moldy and needed to be replaced. There are several experiments that will also be on board including: the Global Ecosystem Dynamics Investigation (GEDI) instrument, the Robotic Refueling Mission 3 (RRM3), and the Rodent Research-8. Image: Dragon capsule atop a brand new Falcon 9 rocket at Cape Canaveral Air Force Station in Florida. The Global Ecosystem Dynamics Investigation (GEDI) high resolution laser ranging of Earth’s forests and topography will provide answers to how deforestation has contributed to atmospheric CO2 concentration. It will also provide details on how much carbon, forests will absorb in the future, as well as how habitat degradation will affect global biodiversity. This research is done through the use of a full-waveform lidar instrument that makes detailed measurements of the 3D structure of the Earth’s surface. Lidar is the laser version of radar, which is able to determine depth and structure of an object (ie. The Earth’s surface) at great detail and resolution. This study is incredibly important for forest and water resource management, carbon cycle science, and weather prediction. Weather forecasting will be enhanced through the improved canopy aerodynamic profiles in order to implement them into existing weather models. Essentially, the biomass and tree canopy thickness and location will provide insight into how Earth’s vegetation will impact future weather systems. Incorporating this detailed information into an existing weather model should give more accuracy to boundary layer (interaction with the ground surface and the lower atmosphere) physics. This project will also aid in the accuracy of climate models, and the impacts of land use change on the climate. 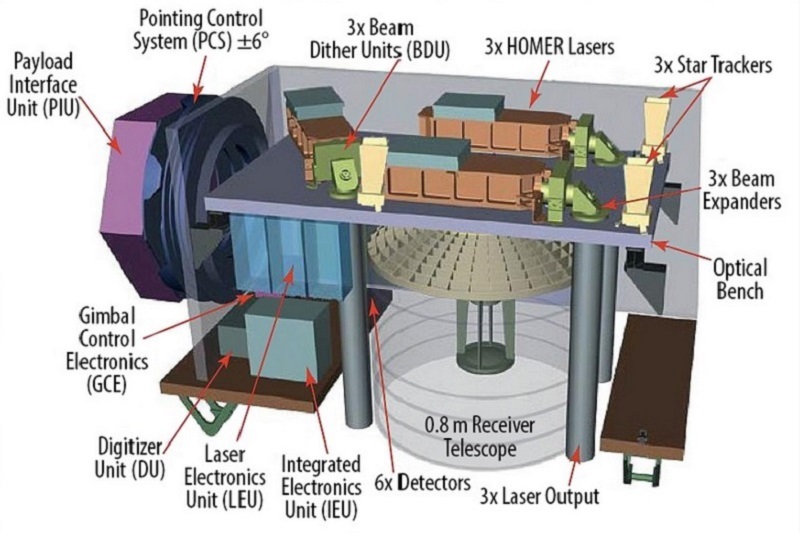 Image: GEDI Instrument showing lasers, optical paths, detectors, and digitizers. Image Credit: University of Maryland. The Robotic Refueling Mission 3 is an imperative study in order to determine the potential for long-term space travel. Spacecraft and satellites use propellant and coolant in order to perform key functions like maintaining critical equipment and maneuvering to stay in a specific location in orbit. These consumables eventually run out, but this study is hoping to provide a service for autonomously refueling spacecraft. This project will attempt to demonstrate innovative methods to store, transfer, and freeze standard cryogenic fluid in space. These fluids consist of liquid methane, liquid hydrogen, and liquid oxygen, but it would be more efficient and easier to store in their frozen states. This would also open the door to being able to refuel on the moon or on other planets, providing additional weight for Earth launching spacecraft. 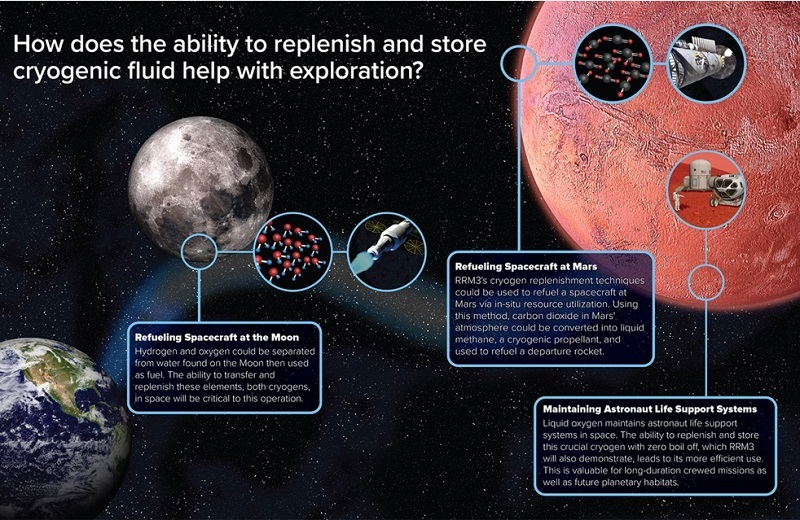 Image: The ability to replenish and store cryogenic fluid can help with exploration. Here are some ways technologies demonstrated by RRM3 could be used at the Moon and Mars. The Rodent Research-8 project will be examining the physiology of aging and the effect of age on disease progression on young and old mice. Some of these mice will be flow up to space on the ISS, and others will stay on Earth to be the control group. Spaceflight has been shown to accelerate aging in humans and rodents. Young and old mice will travel to the ISS for 30-to 40-day or 60-day durations in order to provide researchers with better insight into disease processes related to bone loss, immune dysfunction, cardiovascular deconditioning, and loss of skeletal muscle mass and strength. This research will be able to evaluate: 1) muscle atrophy under microgravity conditions, and to identify pathways and targets that could be used to develop therapeutics for muscle disease. This aim focuses on hind limbs collected from groups of mice exposed to spaceflight for various lengths of time. 2) Changes in various molecular markers from several tissues, such as whole blood, brain, heart, lungs, kidney/adrenal glands, liver, spleen, and small intestines (some tissues are dissected in flight, and the remaining ones on Earth). 3) Scanning mice using a bone densitometer at mission middle, and end-points, to characterize the effects of microgravity on skeletal tissues. This is expected to establish the magnitude and time-course of bone loss during spaceflight exposure for future commercial bone drug testing. The Dragon spacecraft will reach the International Space Station on Saturday, which will bring the number of visiting spacecraft at the International Space Station to six. Three robotic cargo ships – Northrop Grumman’s Cygnus and two Russian Progress freighters – and two Soyuz crew spacecraft. The Dragon is schedule to return to Earth via an ocean splashdown in mid-January.